I know today is supposed to be Food Star Friday, and well, it kinda is. I started out with a recipe. 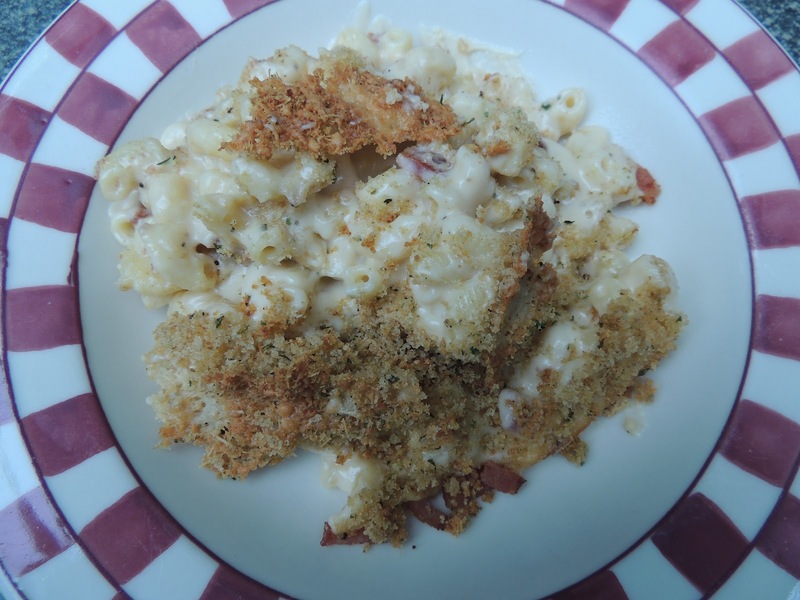 I saw Kelsey Nixon, from Kelsey’s Essentials, making this mac and cheese with bacon. OK well ya know my head swiveled around to see how she was doing it! I love bacon, bacon anything, OK well maybe I chickened out in trying the bacon milkshake, so I will say I love bacon in almost anything. The thing is, for Food Star Friday I usually make a recipe by a food star and then review it, letting you know what we thought about it here. This recipe was too hard to follow and I just ended feeling the need to tinker with it myself. Even though I watched her prepare it on TV it was written kind of backwards and was really hard to follow and not stress out about things not going smoothly. 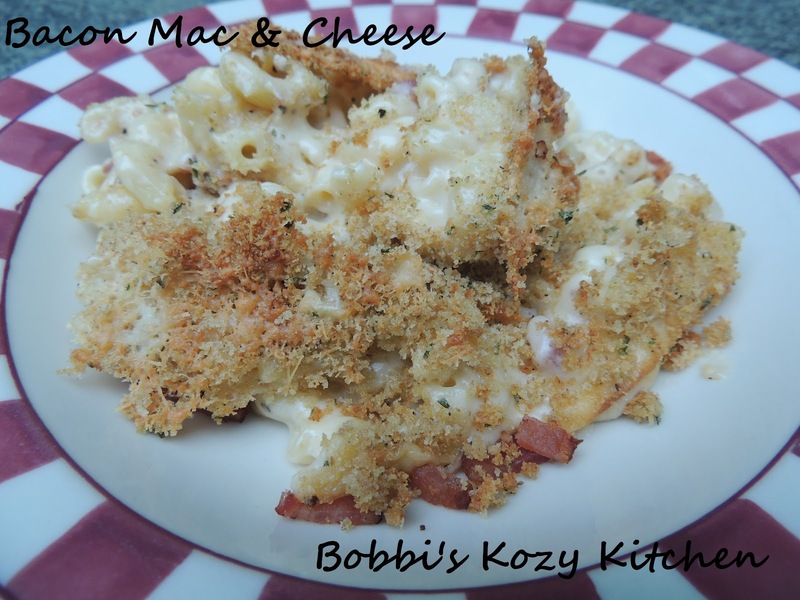 If you want to see the original recipe you can go here to check it out. But below is my version, which I think is much more streamlined and simple to prepare. I didn’t change it very much, just switched the order in which you do things. With that said, this mac and cheese is one of the best mac and cheese I have ever had and I wasn’t the only one that thought so. 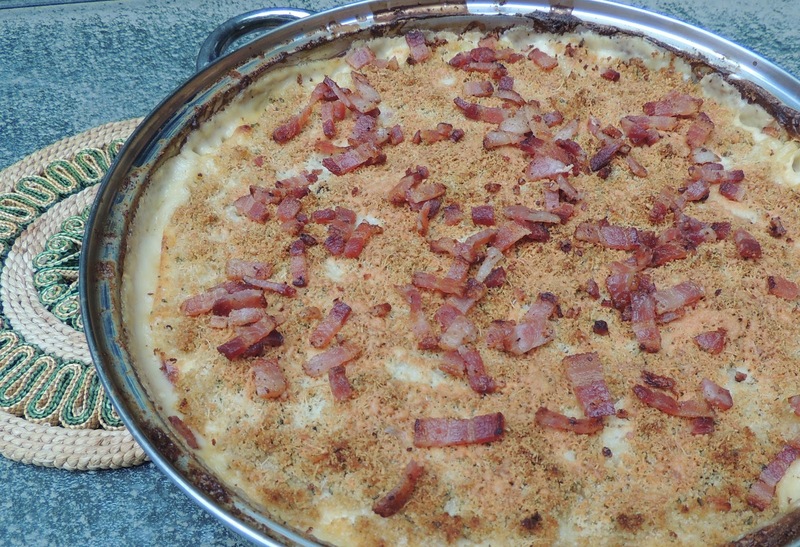 My son, Kevin’s son, and his girlfriend, all raved about it and said it was so good they didn’t ever want me to make another kind of mac and cheese. Sheeyyaa right. I am addicted to mac and cheese. I love the fact that it is so versatile. I could never see me giving up at this mac and cheese and never trying another. 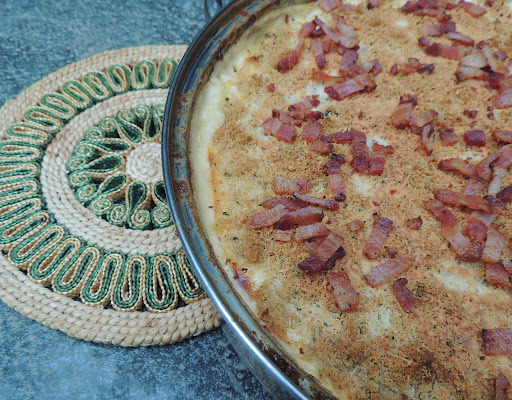 But I can guarantee you that this mac and cheese will be made many many times now. My son, who usually requests Chili Mac for his birthday (I know, his Mom is a food blogger but when given the choice of anything to eat for his birthday he will request chili mac more often than not!) said that this may have become his new birthday meal! One of the things I did like about this recipe is that you make it in a skillet. No mixing things together and then having to pour it into a baking dish to go into the oven. Just more dishes to be washed right? This is all made in one pan (except for the noodles of course) so it is wham bamm thank you ma-am and in the oven it goes! Out it comes, after 20 minutes, all bubbly and golden brown, just waiting for you to dig in and stuff your face with all of that cheesy goodness. Don’t you just want a bowl? I know I do. Too bad there are no leftovers today! In a large oven proof skillet, cook the bacon until it begins to crisp and has rendered it’s fat. Remove bacon to a paper towel to drain, when cool chop. Reserve 1/4 cup of the drippings and then discard the rest. Bring water to boil in a large pot. Salt the water generously and cook the pasta to al dente. Drain the pasta and reserve. In a small bowl combine the bread crumbs with the 1/4 reserved bacon drippings. Stir to combine well. Combine the pasta with the cheese sauce in the skillet. Top with the bread crumb mixture and 1/2 cup of Parmesan cheese. Bake at 400 for 20 to 25 minutes or until the top is golden brown and bubbling. Remove from the oven and sprinkle the rest of the chopped bacon on top. Allow to cool for 10 minutes.